1. Acceptable for processing by a bank: bankable checks and money orders. 2. Considered powerful, prestigious, or stable enough to ensure profitability. While the prime ministers speech explicitly speaks about making the poor bankable, the idea of making cities bankable is more implicit. The plans imagination of the bankable city has two aspects one it should be a city that attracts investment and second that it should be a city that can pay back its dues. The idea of slum freeness ties up to both these imaginations. This segment tries to trace the relationship of property tenure and slum freeness to the creation of a bankable city. A World Class City: A city that attracts investment. Until now Indian cities have largely been perceived as Mega Cities that are off the Global Cities Map. Unlike the global cities that are the command and control nodes of the economy, Mega Cities are perceived as being “big, but powerless”. As Jenny Robinson notes the regulating fiction of the Global City vs Mega City has pushed Mega cities to try and make their way to the map by emulating the “best practices” and aesthetics of the global cities. A good example of this is the Vision Mumbai report produced by McKinsey and Co for Bombay first The report stated that if Mumbai wanted to catapult itself into becoming an investor friendly, “World class city”, it should use Shanghai as its role model and push for neoliberal reforms. The report was quickly adopted by the Government of Maharashtra which set up a task force to put the plan into action. One of the targets that the report set up was to reduce the number of slums in Mumbai from 50 % to 10 %, making an implicit relationship between the presence of slums and investor unfriendliness. The idea of a “Bankable City”, relates closely to this idea of a “World Class City”. The Bankable City is the well serviced, efficiently running; investor friendly city that creates an atmosphere that guarantees returns. A city ridden with slums cannot be showcased, as the slum is seen as being symptomatic of bad governance and instability. Hence the issue of slum freeness becomes of prime importance for the “bankability” of a city. Property Taxes: A city that pays its dues. “As you are well aware, municipal finance is in an extremely unsatisfactory state. This is on account of an inability to properly tap and utilize proceeds from property tax, due to the inadequacies of the property valuation system and inefficiencies in tax collection systems. Municipal governments are not able to recover the cost they incur in providing different services. They use accounting systems, which do not correctly reflect their financial position and therefore their projects do not become bankable and viable”. In order to modernize the city the JNNURM program is pumping in billions of rupees worth infrastructure. But a part of the money spent to money is expected to be recovered through taxes. Property tax is a large source of income for municipalities in India. But in order to tap into cities property tax resources there must be no discrepancy in the ownership patterns of property. A formal government record must show who is accountable to pay the government its dues for the property that is owned. Only a well mapped city with clear ownership patterns can be held accountable to for property taxes. The complex ownership patterns of a slum are not recognized by the state, let alone the idea of pinning down an owner who is accountable to pay taxes. The formalization of slums and awarding of tenure helps the municipality track down an owner liable to pay property taxes thus making the city bankable. “Who loses? YOU ! : The taxes you pay will be used to subsidize amenities for slums as well as provide them houses. The money could have been used to improve city infrastructure and improve your quality of life” argues a newspaper that obviously targets the elite 10% in Mumbai for readership! In reference to the SRS scheme, HT ran an article “How do slum freebies affect you?” The article addressed the grievances of the “Tax-paying citizen” that will be burdened once the poor become “propertied” citizens and start demanding the services that have not been extended to them until now. But to believe that the poor do not / will not pay for services is erroneous. Because on one hand where the government awards the slum dwellers with wealth it also makes them liable to regularly shell out a certain amount of money as property tax. Hence the government’s attempt to create a propertied citizen is closely tied to its attempt to make a tax paying citizen. The RAY plan for slum free cities looks sees property ownership as a tool to create bankable entrepreneurial poor and bankable cities that draw investment and produce returns. The central government supports property ownership for the poor because it’s expected to play an important role in the fast paced economic growth of the neoliberalizing country. Yet there remain many kinks in this simplistic line of argumentation which I shall discuss in my last post. Robinson, Jennifer. “Global and World Cities: A View from Off the Map.” International Journal of Urban and Regional Research 26.3 (2002) : page,531 534. Print. An elite civil society group in Mumbai. Singh, Manmohan. “Inaugural Speech on the Launch of Jawaharlal Nehru National Urban Renewal Mission.” 3 Dec 2005. Web. 17 Apr 2011. Kamath, Naresh. 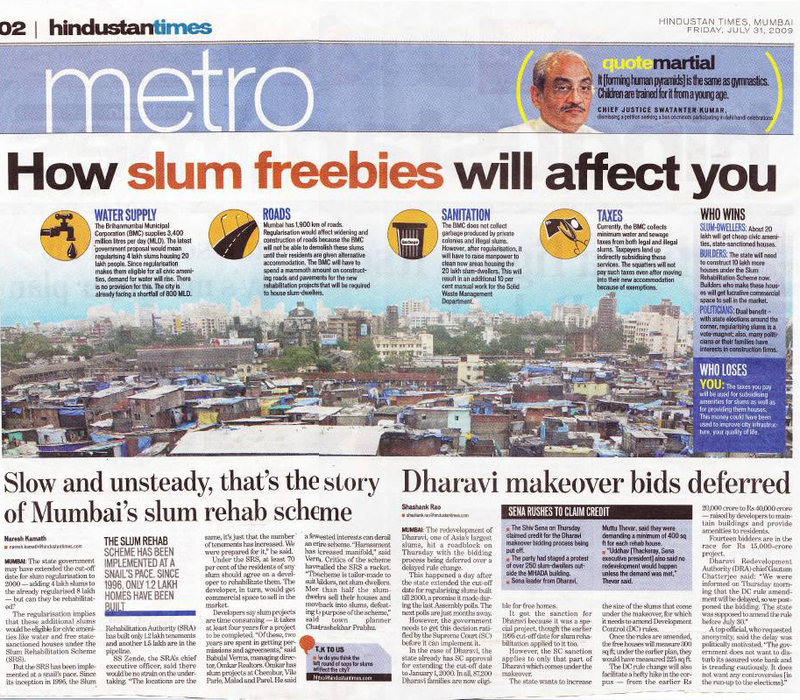 “How Slum Freebies Will Affect You – Hindustan Times.” Hindustan Times 31 July 2009. Web. Image borrowed from Kairvi Dua’s stories of rehabilitation.